As one of today’s most efficient and successful online marketing strategies, influencer marketing will continue to grow and evolve well into 2019. What started as “celebrity” influence has grown into a dominant industry with influencers boasting audiences and engagement of all types and sizes. Studies have shown that 94% of marketers believe influencer marketing delivers 11x more ROI than traditional forms of digital marketing. It can be used to meet various marketing goals, including building brandawareness, increasing customer loyalty, distributing content, attracting followers and driving sales. While influencer engagementwill continue to trend upward in the coming year, what will evolve is how influencers prefer to be compensated. While nearly 70% prefer monetary compensation, a growing number of influencers are becoming open to other forms of payment, including affiliate partnerships. Today, influencer engagement is synonymous with Instagram, but there is much room for growth in other channels, depending on your target audience. While 99% of influencers are on Instagram, 70% are on Facebook, 46% on Snapchat, 42% on Twitter, and 37% on YouTube. When choosing the platform for an influencer campaign, consider how many of your target customers can be found on the platform, and the potential engagement an influencer can generate. Because the better the engagement rate, the more effective your influencer marketing will be. 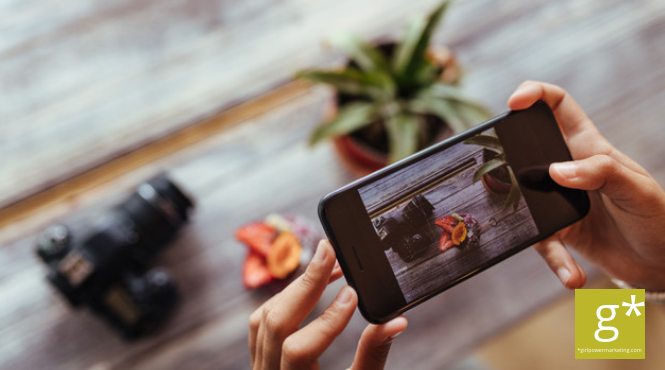 And whether it’s Instagram Stories or Facebook Live, video content created by influencers is one of the most impactful, converting forms of content you can provide. So, look for ways to deliver video content in a way that entertains and delights your audience. Finally, many influencers are beginning to recognize the benefits of building closer, more focused long-term relationships with brands, rather than juggling multitudes of one-off engagements, and are adjusting accordingly. While influencer engagement often brings to mind large brands, especially in the wake of the Colin Kaepernick agreement with Nike, don’t let these million-dollar deals dissuade you from seeking influencer campaigns for your own smaller brand. 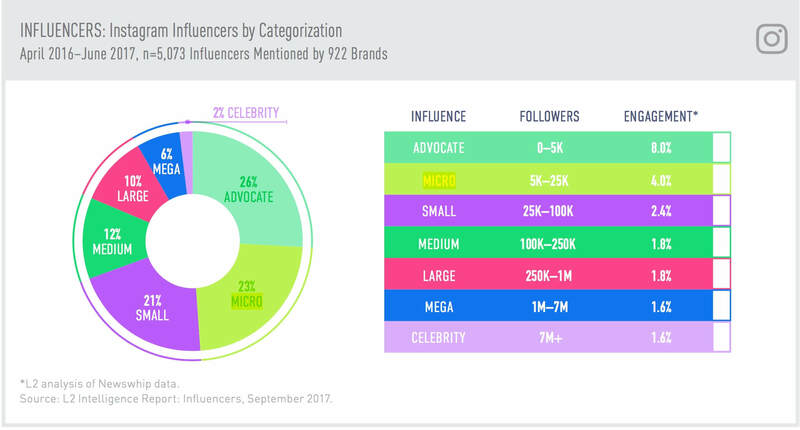 Influencers that best fit smaller businesses may have micro-influencer status—meaning they have less than 25,000 followers (and typically less than 10,000) —but they also carry significant influence (4%) over that smaller audience. That influence translates into action, with 82% of people reporting they are likely to follow a recommendation made by a micro-influencer. When compared to the 1.6% of engagement that celebrity endorsers experience, you can see how these smaller, more cost-effective influencers provide a significant marketing benefit to smaller brands. 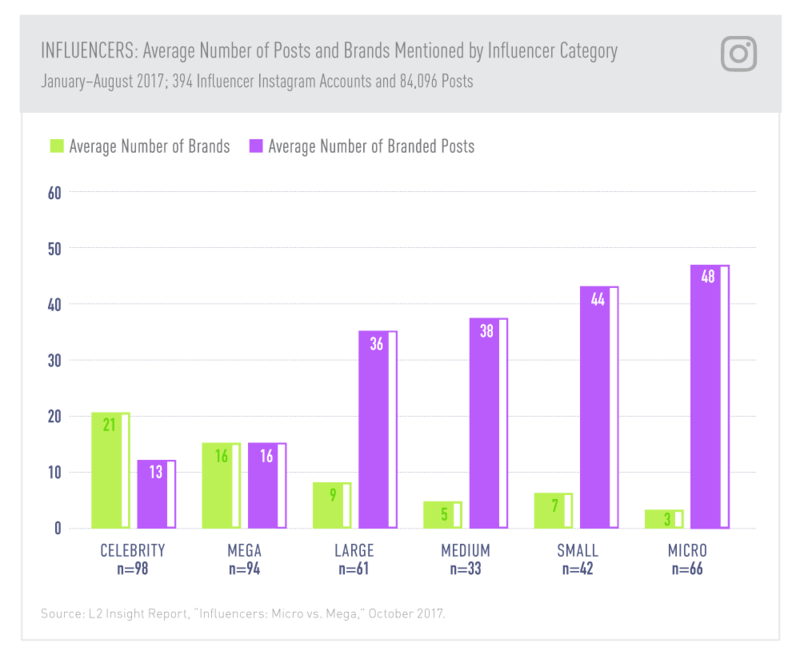 Micro-influencers typically mention brands three times more frequently than celebrity and mega influencers in a way that feels authentic and not forced. That equals more exposure to your target audience for a smaller budget. Cosmetics giant L’Oréal discovered thisrecently when Gartner L2 conducted a study on their recent Champs-Élysées fashion show. 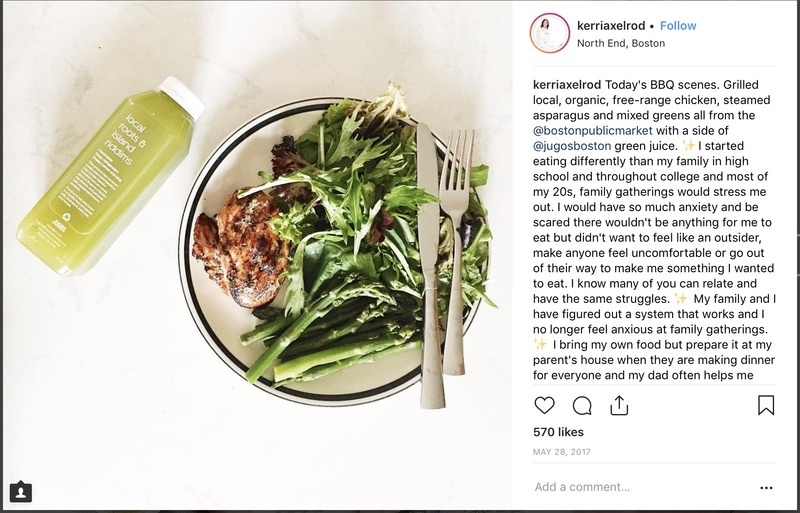 Jugos, a natural beverage company in Boston, works with smaller influencers to spread the word about their drinks. This particular post received 570 likes and 81 comments on an Instagram account with just over 19,000 followers. So don’t sweat the small stuff. If the influencers are reaching your target audience, then you’ve hit the jackpot, no matter how large or small their audience may be. Quite often the most challenging part of any influencer engagement is finding the right influencers. Selecting the right influencers is critical because once you’ve tapped someone to share their opinion on your product or service, that person becomes an extension of your brand. So make sure to do your due diligence. Review an influencer’s previous posts to determine whether they’ll be a good reflection of your brand’s mission and vision. Make sure they are authentic and transparent. Because while you can afford to work with influencers who don’t have large followings, you may never recover from aligning with the wrong influencer. Tools like Buzzsumo, TapInfluenceor Moz’s Follerwonkcan help identify potential influencers by searching relevant keywords and hashtags and filtering the results according to influencer score, engagement, and other interactions. When building relationships with your influencers, it’s important to make sure your brand is relevant to their followers, and vice versa. Take the time to follow the identified influencers before reaching out, and make sure their posts align with your brand. Like, share and comment on their posts to begin building a relationship before approaching them regarding an engagement. They’ll undoubtedly spend time checking out your brand when they see that you’ve shown interest in them. Once you’ve begun to build a rapport and you’re ready to reach out, transparency and clearly defined expectations will go a long way toward building trust with your potential influencers. This includes clarifying your brand messages and brand voice, while also giving influencers the freedom they need to create relevant, authentic posts about their experiences with your brand. Finally, be realistic in your compensation. Think about what you would pay for content that would result in a similar ROI. Compensating with product is still a part of the influencer economy – particularly with micro-influencers or high-value industries like travel – but most influencers now expect to be paid as any other creative marketing resource. You can also offer other forms of compensation, including exclusive event access, a unique look at a product or study before launch, or promotion of the influencer’s own platform. When done correctly, influencer engagement has the power to extend your brand’s reach, but you’ll never know by how much if you don’t measure your results. Using personalized URLs, customized coupons and unique promo codes with tracking linkshelp track engagement scores and possibly purchase decisions. You can also monitor hashtag use and specific keywords within each platform to determine the engagement for each. One tool for tracking hashtag reach is Keyhole, but you’ll want to be sure you’re using a proprietary hashtag to see the most relevant results. Influencer marketing shows no signs of slowing down in the immediate future. As it continues to grow and develop in 2019, brands need to first and foremost research and identify those influencers who align with their marketing objectives to generate impactful campaigns that are believable, transparent and honest. If not, the trust you’ve spent years building for your brand will be gone in an instant. If you’d like more thoughts on developing successful influencer campaigns and engaging new audiences, give us a call. « 5 Strategies for Successful Health and Wellness Marketing	» Is it Content Strategy or Content Marketing?